This new NASA/ESA Hubble Space Telescope image, released to celebrate Hubble’s 26th year in orbit, captures in stunning clarity what looks like a gigantic cosmic soap bubble. The object, known as the Bubble Nebula, is in fact a cloud of gas and dust illuminated by the brilliant star within it. The vivid new portrait of this dramatic scene wins the Bubble Nebula a place in the exclusive Hubble hall of fame, following an impressive lineage of Hubble anniversary images. Twenty six years ago, on 24 April 1990, the NASA/ESA Hubble Space Telescope was launched into orbit aboard the space shuttle Discovery as the first space telescope of its kind. Every year, to commemorate this momentous day in space history, Hubble spends a modest portion of its observing time capturing a spectacular view of a specially chosen astronomical object. This year’s anniversary object is the Bubble Nebula, also known as NGC 7635, which lies 8 000 light-years away in the constellation Cassiopeia. This object was first discovered by William Herschel in 1787 and this is not the first time it has caught Hubble’s eye. However, due to its very large size on the sky, previous Hubble images have only shown small sections of the nebula, providing a much less spectacular overall effect. Now, a mosaic of four images from Hubble’s Wide Field Camera 3 (WFC3) allows us to see the whole object in one picture for the first time. 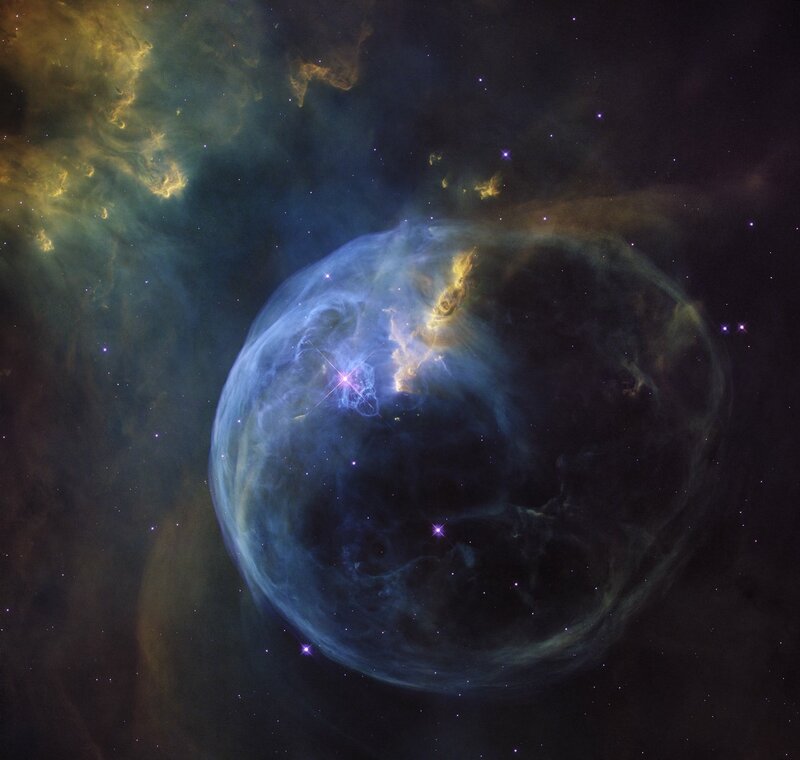 This complete view of the Bubble Nebula allows us to fully appreciate the almost perfectly symmetrical shell which gives the nebula its name. 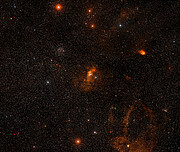 This shell is the result of a powerful flow of gas — known as a stellar wind — from the bright star visible just to the left of centre in this image. The star, SAO 20575, is between ten and twenty times the mass of the Sun and the pressure created by its stellar wind forces the surrounding interstellar material outwards into this bubble-like form. 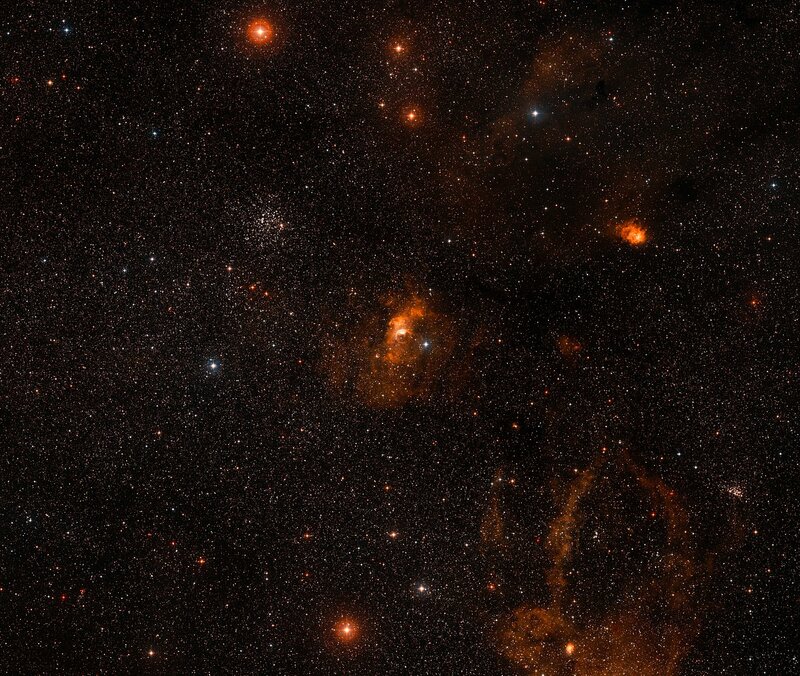 The giant molecular cloud that surrounds the star — glowing in the star’s intense ultraviolet radiation — tries to stop the expansion of the bubble. However, although the sphere already measures around ten light-years in diameter, it is still growing, owing to the constant pressure of the stellar wind — currently at more than 100 000 kilometres per hour! Aside from the symmetry of the bubble itself, one of the more striking features is that the star is not located at the centre. Astronomers are still discussing why this is the case and how the perfectly round bubble is created nonetheless. The star causing the spectacular colourful bubble is also notable for something less obvious. It is surrounded by a complex system of cometary knots, which can be seen most clearly in this image just to the right of the star. The individual knots, which are generally larger in size than the Solar System and have masses comparable to Earth’s, consist of crescent shaped globules of dust with large trailing tails illuminated and ionised by the star. Observations of these knots, and of the nebula as a whole, help astronomers to better understand the geometry and dynamics of these very complicated systems. As always, and twenty six years on, Hubble gives us much more than a pretty picture.